Report on the State of Bicycling in Washington D.C. 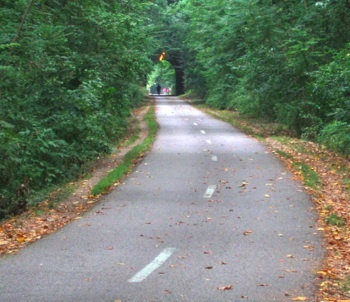 The Well-Loved Crescent Trail in Washington D.C. But for the most part I was pleased by what I saw in D.C. I saw an active bike community. I saw groups of tourists touring the city by bicycle. I saw lots of bikes and scooters parked around the buildings downtown. And for me the crowning jewel of our nation’s capital is not the Capital building, but the Crescent Trail. This wide tree-shaded bike trail circles more than 10-miles around the western side of the city. It is well-used by bicyclists, runners, and strolling families. It is built from an old railroad bed that passes over and under most cross streets. It is I think what all cities should aspire to create, ultimately for all short-distance non-commercial transportation. Imagine if all the beltways in our country were replaced with tree-lined boulevards on which ultralight vehicles (bicycles and cars weighing less than 100 pounds) rolled along at 15 mph amongst runners going 6 mph and pedestrians strolling at 3 mph. You might say “yes Larry it sounds very idyllic but it’s not practical; people wouldn’t be able to get to work on time on a bicycle.” I would reply that Washington D.C. is only 10 miles wide; at 15 mph a bicyclist could get from any one point to another in less than an hour. That’s certainly not the case now for people traveling by car. The Crescent Trail is the best example I’ve seen of How Wonderful Transportation Could Be If Only We Decided That’s How We Want It to Be. It doesn’t require any new technology. It doesn’t require drastic sacrifices. It just requires using what we already have in a new better way. Posted on April 12, 2010 March 1, 2012 Author larryCategories Urban PlanningTags paradise1 Comment on Report on the State of Bicycling in Washington D.C.
One thing I love about biking is that you don’t have to go where the road goes: you can take off in directions that are closed to cars. Down the alley, through the woods, across the fields, around the back. If there is a chain across the road, no problem. If the road is washed out, no problem. You are good to go if you’re on a bike. In fact, often these back ways provide a safer way to get from one place to another than the front way. I had to bike a couple of errands today and I discovered a couple of neat spots. One was behind a shopping plaza when I was cutting a corner to get home. I found I was able to get from one shopping plaza to another by going across a muddy wooded stretch. It was another world back there, an exquisitely depressing world full of trash and decay and cigarette butts and weird discarded machinery. And yet it was a world more real in a way than the clean commercialized world created by the stores at the front of the shopping center. I found another cool spot in Cayuga Heights, the fancy neighborhood in Ithaca. I’ve been meeting some friends there on Saturdays to go running, and I noticed on the map that there were two streets that almost connected but did not. Almost-connected streets on a map almost always indicates a cool place accessible only to pedestrians and bicyclists. I went to investigate. I tentatively headed down a parking lot. Sure enough the pavement stopped but an alluring path continued. I started down the path and I suddenly looked up: all the trees along the path were lined up for a hundred yards! It was magical! I have come across several other tree-lined spots like this in Ithaca, relics from a time when people grew tree-lined drives to their mansions. To accommodate the age of the automobile people had to widen their driveways. They were forced to either cut down their trees or make an alternate driveway. The few driveways I’ve seen must have survived because an alternate was possible. This little tree-lined discovery did not disappoint. I am definitely adding this place to my route when I go to meet my friends on subsequent Saturdays. This is a good example of how I gradually develop a commute over time: I try different ways, see which ones connect, see which ones are pleasant, and over time I can get to most places by bike paths, back roads, back alleys and scenic drives. So can you. Happy trails! I’m reading the book Rowed Trip by a couple that rowed and biked from Scotland to Syria in 2008. When they were biking they towed their custom rowboats behind their bikes, and when they rowed they stowed their folding bikes in the hold of their boats. Cool. …my spirits were buoyed by…the fabulous condition of the bike path. Even though it was wide enough for a car and paved, it was strictly for non-motorized travel. Regular signs marked distances to upcoming communities, while fruit trees and park benches appeared with regularity. I was happy to see the path was amply used by dog walkers, stroller-pushing mothers and touring cyclists, almost all of whom seemed intrigued by our road boats. Cycling is big business in Germany. Every year millions of touring cyclists pedal along the nation’s 50,000 kilometres of bike paths. Not only is cycling an excellent way to discover a country, encouraging you to experience hidden gems away from typical tourist itineraries and to eat hearty meals with complete justification, it fosters a host of mom-and-pop businesses catering to the visiting pedaller. Small villages that would be overlooked by tour buses have bustling cafés, bicycle shops and accommodation geared to passing cyclists. The bed and breakfasts are wholesome and inviting, the kind of place where the hosts would yell at you in contented bliss and topple oversized swaths of fresh bread and farm cheese onto your breakfast plate. The pleasure of lengthy cycling trips on roads exclusively for human-power traffic is a foreign concept for Canadians. While we have the gorgeous scenery, long-distance cycle-touring in Canada involves sharing the roads with cars and trucks. The noise, fumes, and danger detract from the trip, and our experience in Germany made me realize what we’re missing. On bike trails, you can let your imagination wander without worrying about straying into the path of a semi, the birdsong comes through undiluted, and it is easy to chat idly as you pedal side by side. When I praised the quality of the German cycling paths, our host related the origins of their cycling movement. In the 1970s, a group of students spearheaded a drive that ultimately led to a pace of bike-path construction exceeding that of roads. Since 1976, the total length of cycle routes in Germany had quadrupled from 12,911 kilometres to by some estimates about 50,000. Canada has a few quality bicycle paths, but they are not interconnected, and for most randomly chosen A-to-B trips, a cyclist is forced to follow busy roads. Whereas in Germany, a pleasant bicycle path can be found connecting most towns. In 2007 Colin and I cycled in the Pacific Rim National Park on the west coast of Vancouver Island, a world-class tourist destination, and we encountered some or our most dangerous cycling conditions ever. We’ve cycled through Third World countries with a better shoulder for cyclists than those found around Long Beach. When we queried the park officials, they insisted the environment couldn’t take the extra burden of a track catering to fossil-fuel-free vehicles. The highway and numerous vehicular parking lots are the limit of what the park can handle. The Canadian government could learn a lot from the Germans. Germany’s abundance of cycling paths is a case of “if you build it they will come”. In Münster, Germany’s most cycling-friendly city, bicycles are used for one in four trips. By comparison in Canada’s most pedalled city, Victoria, B.C., only one in twenty trips are made by bicycle. On average, 10 percent of trips in Germany are pedal-powered, which is five times higher in Canada and ten times higher than the United States or the United Kingdom. I wasn’t surprised to find that more people cycle here as to discover it hadn’t always been that way. The advent of the automobile led to a precipitous decline in cycling in Europe, which would have undoubtedly continued if it hadn’t been for concerted efforts. In the 1950s, cycling in England was more popular than it was in Germany, as the Germans fully embraced the automobile industry, building world-class autobahns and mass-producing cars. Interestingly, grassroots efforts in Germany began breathing life back into cycling as an alternative, while Britain continued catering almost exclusively to the car. It’s hard to say what cultural forces spawned such differences, but these two European nations, both with strong economies, now have distinctly different cycling habits. The Brits are tied with Americans in their rejection of the bicycle, while Germany is a world leader. The thing is, people don’t want to ride their bikes if it elevates their chances of dying or being maimed, and that is a real likelihood in the U.K., U.S., and Canada. If you ride your bike in the States, you are seven times more likely to be injured and 2.5 times more likely to die than if you ride in Germany—a factoid that may help explain why in America 75 percent of cyclists are male, while in Germany and the Netherlands, the number of women on bikes is equal to our surpasses that of their mail counterparts. We were usually the only foreigners on the bike paths and felt as though we had discovered a national secret. In my estimation Colin and Julie Angus, the authors, are nothing less than heroic. We saw them speak at the National Geographic Society in Washington D.C. last November. The Society had awarded them Adventurers of the Year for 2006. They are professional adventurers who don’t hesitate to row across the Atlantic or do other such impossible-sounding feats. Colin and Julie are leading the way for the rest of us who embrace human-powered transportation. I hope that some day people will react to seeing a bike towing a rowboat not with an incredulous snort but with a yawn while they mutter “there goes another couple biking and rowing across Europe”. Posted on January 21, 2010 March 1, 2012 Author larryCategories Urban PlanningTags heros, paradiseLeave a comment on German Bike Paths Rock! Let’s assume that over the next hundred years everybody does the sensible thing and lets their cars (including electric cars) fall into ruin. Bye bye Passat and Accord. Bye bye Hummer and Prius. In their place people will only use pedal power and electric bikes. Furthermore assume that these vehicles weigh between 15 and 100 pounds, they are no more than four feet wide, their top speed is 20mph, and their range is about 50 miles. This is a pretty short range, so in order to go cross-country people will ride trains. In this future, train stations will be 1 to 25 miles apart all over the country. 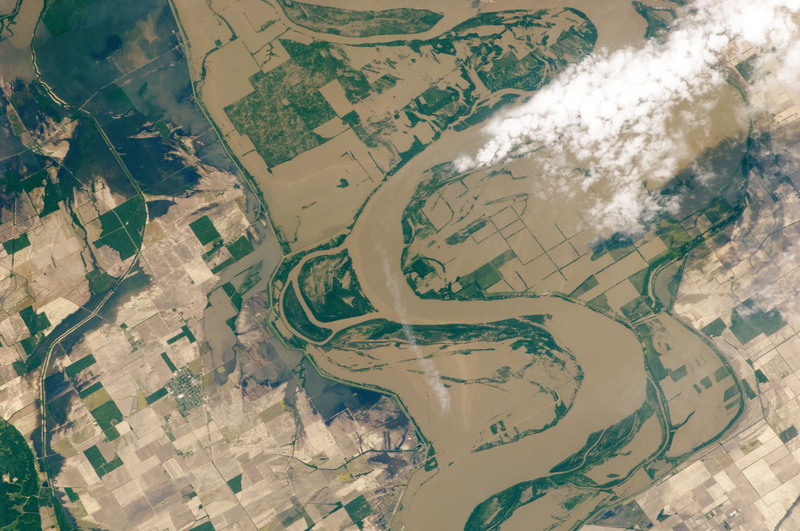 How will these changes affect our landscape? What will this future look like? Roads, overpasses, bridges, etc. will only have to bear loads two orders of magnitude less than they did during the loathsome auto era. That is, they need only support 30 pound vehicles rather than 3000 pound vehicles. All this infrastructure will be correspondingly less thick, less expensive and even unnecessary. Goodbye clover leaf and other concrete monstrosities. Hello covered bridges. In this future, snow will be white. No more snow gray from auto exhaust. And no more snow plowing. We may want a big machine to compact the snow, but our vehicles will be light enough that they can ride on top of the snow instead of having to rely on snow plows to laboriously push the snow aside. Under this scenario, pavement for suburban and country roads pretty much becomes unnecessary. Heck, you may even be able to grow grass on your “road” if there isn’t too much bike traffic. Roads closer to the cities may require crushed stone. Only the very center of cities will require pavement. Our highways will be scenic paths through the fields and woods. Roads can be much narrower. One-way streets will be unnecessary. Multi-lane highways will be unnecessary. We will have to come up with some use for the exorbitant number of lanes previously deemed necessary. Hotels? Roadside taverns? A vehicle going less than 20mph and weighing less than 100 pounds can stop very quickly, can swerve around obstacles, and won’t necessarily harm something or someone it does run into. Flattened possums, raccoons, and squirrels on the roadside will become unknown. And in this future you will be able to let your kids and pets wander freely throughout the neighborhood (like people used to do a century ago). And kids will be empowered in other ways: since these vehicles of the future are not so dangerous as cars, kids will be able to drive them at an early age. Teenagers won’t have to wait until they are 16 to get their wheels. Kids can drive themselves to the soccer game—soccer moms are no longer necessary. Parking lots will be minimal. The malls of our present era will look ridiculous. Think of all the former parking lots that will be opened up for parks and playgrounds. Get out your jackhammer, we can start now. City centers of the future will be walkable. Traffic jams will be a thing of the past. People of the future looking at photographs of our traffic jams will either laugh or scowl. Why don’t pedestrians and bikes form traffic jams? A mass of slow moving thin vehicles can perform a very human dance to get through a bottleneck. Think about all the people moving past each other in Grand Central Station, sub-consciously negotiating with each other to get where they are going without stopping. Now think about the same amount of people sitting in their cars staying in their lane on a highway stretched out for miles and miles waiting to go forward. The future will be more like Grand Central Station: happy chaos rather than ordered misery. People will discover what bike couriers in big cities have known for a long time: it is faster to get across town going 10 mph continuously on a bike than going stop and go at 30 mph in a car. In the future, traffic signage can be minimal. First of all, it can be much smaller. Have you ever looked at a billboard close up? They are enormous! But that’s what it takes to get someone’s attention who is whizzing by at 65 mph. What size does the same sign need to be to be seen by a bicyclist going by at 20mph? Smaller. Secondly, the navigation technology of the future will make it very difficult to get lost. If you can see on an electronic map where you are and where you want to be, why do you even need signs, except maybe street signs? Thirdly, slow-moving thin bikes make many signs unnecessary. We won’t need one-way signs since bicycles are thin enough to go both ways on almost all streets. If we’re all going less than 20mph we can yield instead of stop, so we won’t need stop signs or stop lights on almost all streets. And we won’t need speed limits since they are built into our electric bikes’ electronics. Think about what that will look like—a city without signs. It goes without saying that energy use for transportation in the future will be extremely low, maybe even entirely human power and renewable resources. Batteries for electric bikes will be charged using one blanket-sized solar panel per person. A day’s worth of sun would be enough to power several 10-mile trips. And a person can use the same batteries to power all the lighting, personal heating units, and electronics they need. People will be completely off the grid and out from under the thumb of OPEC. We’re already losing the telephone poles. There go those unsightly utility poles too, except maybe for the trains. The trains of the future will require centralized power. However, the power can likely be generated from solar, wind, and hydroelectric sources. Sound impossible? Believe it or not, the technology for this futuristic scenario already exists. It simply requires the will of the people to make it a reality. I gave up driving this summer. Instead I bought a “cargo” bike that I use for errands less than 10 miles away. My bike can carry 400 pounds up steep hills, which equates to two adults or my 9-year-old daughter and four bags of groceries. My bike has a top speed of 20mph (as required by law to be considered a bike) and a range of 20 to 40 miles depending on load and hills. My bike battery can be charged entirely from a solar panel in about a day. My bike was rather expensive (several thousand dollars) but if it were mass-produced it could easily cost less than a thousand dollars. But it won’t be mass-produced unless there is a demand for it—I encourage everyone to go out and buy an electric cargo bike. When we became an auto-centric culture a hundred years ago we gave up more than we realized. We gave up the outdoors. We gave up clean air. We gave up quiet streets. We gave up safety. We gave up simplicity. What did we get in return? We got convenience. We got speed. We got unprecedented comfort. Do we really need these things? I for one want to get back what was lost.